Difference between revisions of "CDO"
CDO is a 3-tiers solution for '''distributed shared models''' and a complete '''model repository''' server. The storage back-end is pluggable and migrations between direct JDBC, Hibernate, Objectivity/DB, MongoDB or DB4O are seamless for CDO applications. You may also want to visit our '''[http://www.eclipse.org/cdo homepage]'''. |valign="top" width="400"|With CDO you can easily enhance your existing [[EMF]] models in such a way that they can be stored and subsequently maintained in a central model repository. 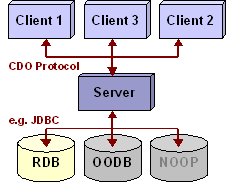 While object relational mapping against a JDBC data source on the server side is the shipped default CDO provides for ''pluggable storage adapters'' that allow you to develop and use different mappers (like Hibernate- or OODB-based). On the client side CDO provides a default integration with EMF, the Eclipse Modeling Framework, although other model integrations on top of the ''CDO protocol'' are imaginable as well. You may also want to visit our homepage.